Really! Vicky Donor is a big hit? 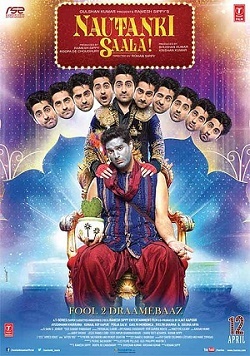 The lead actor, Ayushmann Khurrana has become an overnight star! Women like him and men relate to him. Let’s make a film with him. Story? Ok, let’s sign him first and then we’ll find a story. Ok.
You remember the makers of Bheja Fry adapted a French comedy? Let’s do that and make a fun, small budget film with Khurrana… it will be our little-big film of 2013. Heard of this funny French film, Après Vous? It means After You. It’s about a guy who saves another guy from committing suicide. The one who wanted to die is a total train-wreck and our hero decides to help him by giving him work and winning his girl back. Ok, what else? A love triangle! Ok, that sounds good; we can throw in some songs. Perfect. So Ayushmann plays the nice guy; who plays the loser? Kunaal Roy Kapoor, remember his ridiculously funny performance in Delhi Belly? Perfect. And the girls? Anyone will do really as our film is about these two guys. Ok. In the French film, the lead character was a restaurant manager… that’s not very exciting in India, what do we do? We’ll make him a theatre actor and director. That way, we can play with the costumes and create a more whimsical mood. Sounds like a plan. Let’s start shooting. Done. Selling proposition – a bromance… a comedy of errors… a film for all… a multiplex hit! How much can Ayushmann do to save a drab of a film? Dear Mr. Rohan Sippy, did you think you can make a good film inspired by a mediocre one? Actually, why blame you when the Indian viewers help mediocre films become big hits. Look at Dabangg 2… it was essentially a collage of left-over scenes from Dabangg. Coming back to Nautanki Saala; the film has its moments, has a few jokes to laugh at. First forty-five minutes are good but then the next ninety are painful. Why didn’t they make an hour-long tele-film instead? Ayushmann Khurrana plays Ram Parmar or RP, the Good Samaritan. He acts well and is likable but tries too hard to save the film. And those Angry Bird slippers! Kunaal Roy Kapoor plays Mandar Lele, the loser. He is a talented actor and will do better with good scripts. Other good stuff – Using “So Gaya Yeh Jahan, So Gaya Aasman” from the film, Tezaab in a remix version. Sulbha Arya as Ajji, Mandar’s brutally honest grandmother. Girl 1 – Chitra played by Gaelyn Mendonca. She can act but is quite irritating in the film. Girl 2 – Sita played by Evelyn Sharma. The brief to her was to look hot and she did. Girl 3 – Nandini played by Pooja Salvi. Her scenes can be used in film school to show what not to do. Check out the scenes where she tries to cry. Cameo by Abhishek Bachchan – bleh! They made a comedy film keeping in mind our intellect. Dear Hindi film audience, the joke is on us. I just knew this movie was gonna flop. The story didn’t seem to be very good. And they trying only to cash in on Kunaal Roy Kapoor and Ayushmaan’s popularity right now. Thanks for the review. You probably save me a couple of hundred bucks. Wasn’t that bad. liked it. Amazing movie! Ayushmann is an all time favorite! Get movie recommendations and watch your favourite movies for free via http://www.flickstree.com! Movie is available to watch via Flickstree.com ! Got an amazing app. Movies are available for free. Must have app . Visit FLICKSTREE .